On a recent visit to Thunder Valley Community Development Corporation (CDC) in Porcupine, South Dakota, something extraordinary was evident. A spark had been ignited and a cultural movement of change was happening at Thunder Valley CDC, which has become a powerful catalyst of innovative change for the Oglala Lakota people of Pine Ridge, South Dakota, and all across Indian Country. As an enrolled member of the Sicangu Lakota Nation in Rosebud, South Dakota (neighbors to Pine Ridge), and being part Oglala Lakota myself with family still living in Pine Ridge, it struck me how Thunder Valley has been able to create considerable change in the area. What once used to be barren prairie land, a pathway out of poverty has been created with a master-planned community being built at the Thunder Valley Community Development center site. 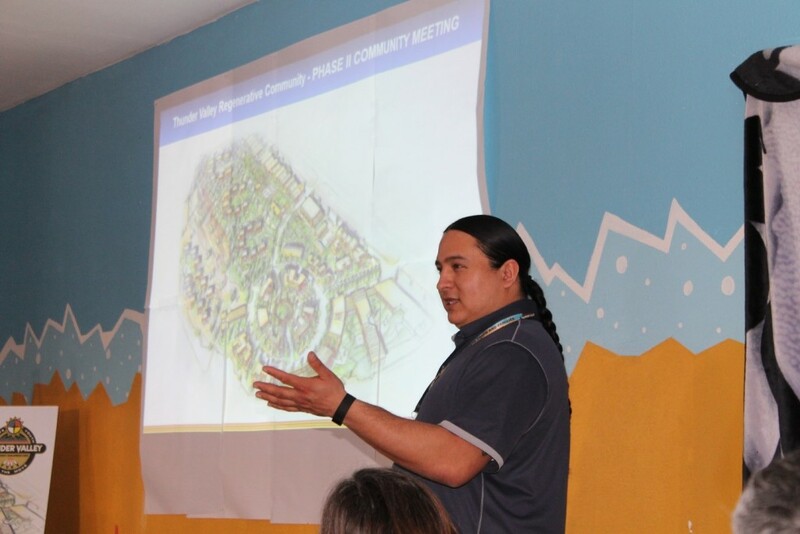 First Nations Development Institute (First Nations) saw this cultural movement of change first-hand while attending a planning design meeting for phase II of the Thunder Valley community development project on February 8-9, 2016. Three members of First Nations’ staff – Senior Program Officer Catherine Bryan, Grants & Program Officer Kendall Tallmadge, and myself (Program Officer Tawny Wilson) – were able to attend this important meeting with Thunder Valley Executive Director Nick Tilsen, Deputy Director Sharice Davids, Director of Advancement Liz Welch, and Director of Design Kaziah Haviland. Other attendees included BNIM Project Manager Christina Hoxie, BNIM Associate Principals Vincent Gauthier, Laura Pastine and Adam Weichman, KLJ Engineering’s Dana Foreman, and Art Space’s Senior Vice President of Asset Management Greg Handber, as well as Allen Orechwa, Chief Financial Officer of Clearing House CDFI (community development financial institution). Rural & Native American Initiative Director Russell Kaney and National Renewable Energy Lab’s Engineer Chuck Kurnik were also an integral part of the phase II planning meeting. 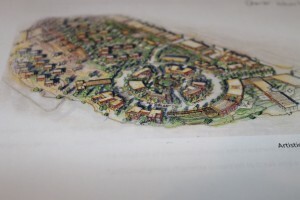 The plan involves building a sustainable community powered by wind energy and solar panels with strategically designed dwellings aimed at reducing energy costs and improving efficiency. In phase one of the community development plan, a community center and single-family homes will be built at a cost of $9.5 million, and is projected to take three years for completion. Within 10 years, when phase II is fully completed, the community will house approximately 1,000 people. 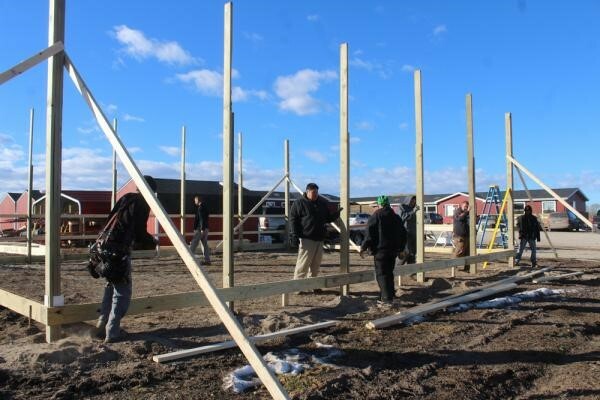 The community development efforts of the people at the meeting and their partners across the country have contributed to this innovative and unprecedented community development project’s growth on the Pine Ridge Reservation. Normally hope and inspiration are not easily found in one of the most economically challenged places in the country, but what is happening on the Pine Ridge Indian Reservation is not considered normal by most standards. 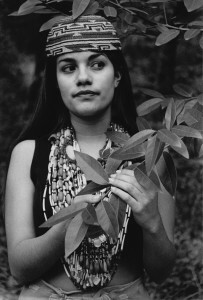 Thunder Valley began as a movement and cultivation of being empowered spiritually and taking responsibility for the future by creating a movement to build a healthy and sustainable community. Instead of just talking about creating change, the team members at Thunder Valley have rolled up their sleeves and are making it happen by doing. First Nations has been an ongoing supporter of Thunder Valley since 2005 and has awarded the organization with various grants and technical assistance through our Native Youth and Culture Fund, Native Agriculture and Food Systems Initiative, and Native Arts Capacity Building Initiative. 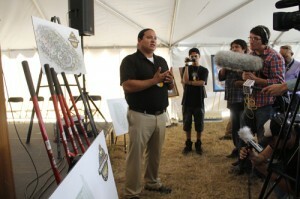 In addition to providing funding, First Nations administers technical assistance to Thunder Valley CDC. Thunder Valley has proven that a little bit of funding and a whole lot of hope, belief and sheer determination go a long way. The people of the Oceti Sakowin Oyate are undergoing a revolution. After surviving generations of colonization, the Lakota, Dakota and Nakota people are rising up from the weight of colonial legacies and building upon the work of their Indigenous ancestors to create a brighter future. 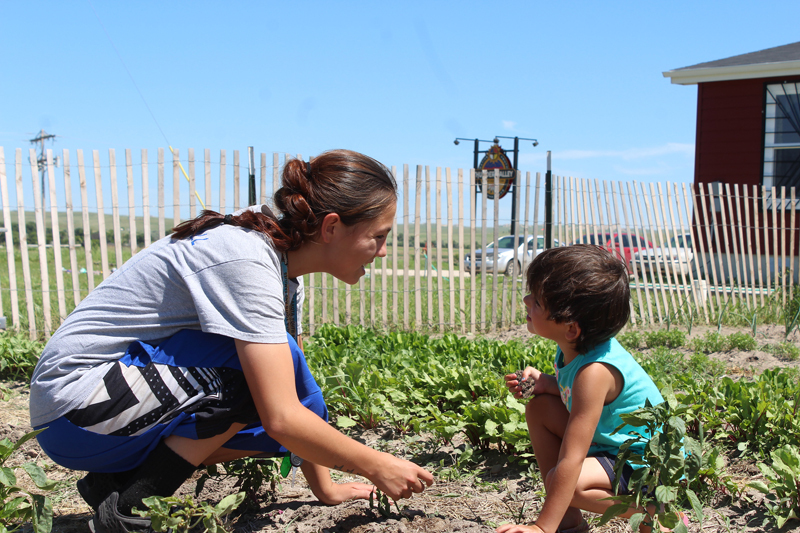 On the Pine Ridge Indian Reservation, home to the Oglala Lakota, the Thunder Valley Community Development Corporation (CDC) is helping to lead this transformation by creating models of change that will overpower the inter-generational poverty that has spawned from colonization. One of the first grant recipients of First Nations Development Institute, Thunder Valley CDC is actively working to address systemic inequity by bridging Lakota culture with the rapid pace of change in contemporary society. High suicide rates, poor health outcomes, poverty and unemployment are rampant throughout the Pine Ridge Indian Reservation. To address these issues, a group of young Lakota people, including Tilsen, decided to take action. Starting more than 10 years ago with a “budget of nothing,” they set out to combat the root causes of poverty and lack of progress on Pine Ridge, and from these efforts Thunder Valley CDC was established. According to Tilsen, at the time Thunder Valley CDC was founded, there were no community development corporations on the Pine Ridge Reservation, and only a handful in Indian Country. Thunder Valley CDC needed resources to get started and realize the vision of making systemic change, which for them entailed building a regenerative, sustainable community. “We knew we had a responsibility to improve the quality of life for the Lakota people,” said Tilsen. By building a regenerative community, Thunder Valley CDC is creating an ecosystem of opportunity as a point for leveraging regional equity. First Nations Development Institute helped Thunder Valley with this vision by providing a series of grants through the Native Youth and Culture Fund. Early objectives included acquiring a facility, and devising a development plan to create jobs, provide housing, and build the economy. Further goals included establishing a Youth Leadership Development Program to help young people connect with their Lakota culture, and engage them in finding ways to make the community stronger. Ongoing support from First Nations has helped the organization grow in size and capacity, and position itself for additional funding opportunities. The organization has been able to not only break ground on the regenerative community development, but also continually seek new ways to improve the resilience, health and prosperity of the Oglala Lakota people. Thunder Valley CDC’s first Youth Leadership Development Program cohort has organized several healthy living events for peers and community members, using Thunder Valley CDC as a resource for making their visions into reality. Events have included a basketball tournament, a color run, a mud volleyball tournament, and a glow run, all completely organized by the youth cohort. “We’ve created a space for youth to make decisions about their own future, without us dictating what that future would be,” Tilsen said. Today, Thunder Valley CDC has grown from a $50,000-a-year organization to over $2 million, and from having no facility and a few volunteers to over 24 employees in two locations. Through the years, they have served more than 1,000 people of Pine Ridge, engaging an additional 2,500 people in various programs and activities. 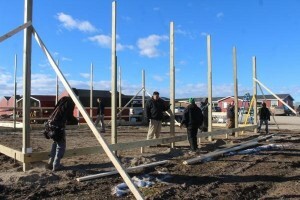 They have established several initiatives and programs, including a Workforce Development Through Sustainable Construction programs (in its first cohort), Youth Leadership Development Program (also in its first cohort), Food Sovereignty Initiative, Lakota Language Initiative, Social Enterprise Initiative, Sustainable Home Ownership Program, and Self-Help Program. 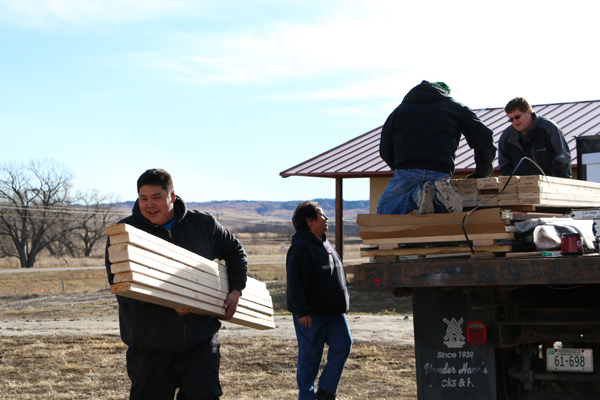 And where once there were no blueprints to follow for this type of impact, there are now nine community development centers on Pine Ridge, all benefiting from the model of Thunder Valley CDC. “It’s our goal that what we’re doing here not only serves our community, but is an inspiration throughout Indian Country,” Tilsen said. A little learner at the Lakota Language Initiative’s Immersion Childcare Program learns the Lakota alphabet. Tilsen said Thunder Valley CDC is grateful to First Nations for the ongoing partnership, citing funding from both the Native Youth and Culture Fund and the Native Agriculture and Food Systems Initiative. In addition to providing funding, he said First Nations brought Thunder Valley CDC together, helping them learn best practices of other grantees, providing technical assistance for communications and fundraising, and opening the door to additional opportunities and funders. For more information on the Thunder Valley Community Development Corporation, visit http://www.thundervalley.org/.